We're not going to be shy about this: this is the finest turntable we've ever heard. Designed and built to honor 30 years in the audio business, the Model 30 incorporates the highest sonic and engineering goals of its maker, the late, great Alistair Robertson-Aikman, founding visionary and guiding light behind SME, Ltd. 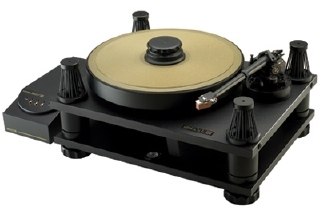 The upper plinth of the 'table (where the platter and tonearm reside) is suspended in an ingenious combination of 48 tensioned O-rings and viscous damping (visible as the "towers" in each corner) . A threaded reflex clamping system is used to maintain maximum contact between the LP and the platter surface, cutting resonances to a minimum and making vacuum hold-down superfluous. The platter itself is a multiple layered affair, again to damp any spurious resonances, and is made as massive as possible to maintain inertial speed stability. Spindle and bearing hardness and machining are of the highest possible quality. The outboard control box is straightforwardly designed and allows for (adjustable) playback speeds of 33 1/3, 45, AND 78 RPM. The built-in bubble level allows for precise leveling adjustments. A modifed version of their top-of-the-line Model V tonearm features striking gold lettering and highlights. (Long ago I had the opportunity to ask Robertson-Aikman if the Model 30s armboard would accept other tonearms and, in typical deadpan fashion he replied: "And why would one want to do THAT?" ) Every piece of the Model 30 exudes the superb level of craftsmanship and attention to detail that has made SME one of the most respected names in audio.Sonically, the Model 30 provides an experience so close to hearing mastertape that it's shocking. The lower octaves, in particular, have a solidity, power, and purity that's remarkably like real life. The Model 30 defines the concept of neutrality: it neither adds nor subtracts anything from the recorded event, simply presenting it as honestly and musically as the material demands. We've never heard another 'table bring LPs to life to this degree. A groundbreaking achievement, not just in LP playback, but in musical reproduction. Note: The designation as Model 30/2A denotes the inclusion of the special edition Series V tonearm. Call us at 707-575-8626 for pricing and availability.